Chuck Swisher has been fortunate much of his career to shy away from serious injuries. That stopped during the Sikeston (Mo.) Jaycee Boothill Rodeo, when Swisher suffered a torn anterior cruciate ligament while serving as a protection bullfighter. 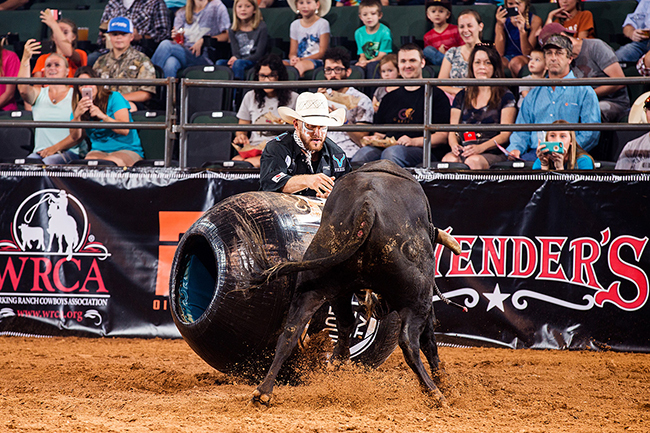 In that role, his primary job is to protect fallen bull riders and all others inside the arena. Swisher’s right knee buckled, but it didn’t slow him down. In fact, the Dover, Okla., man didn’t realize the depth of his injury until the rodeo had ended two nights later. That night he had an inkling of news ahead. A few days later, an MRI in Oklahoma City revealed the tear. Swisher has scheduled ACL replacement surgery for Aug. 30 in Dallas by noted rodeo surgeon Dr. Tandy Freeman. That means he will miss four to six months of not only the Bullfighters Only season but also miss rodeos in which he was hired as a protection bullfighter. “By stepping into the arena, I know what I’m getting myself into,” Swisher said. “Injuries are part of the game. Being upset won’t solve anything. Swisher is just 26 years old, so he has a long future in front of him as one of the top bullfighters in the game. That’s another reason to make sure the repair is complete. That doesn’t mean humor can’t be part of the remedy. “Hopefully by the time I have surgery, Usain Bolt can tell me to have just part of his ACL,” he said jokingly. Though he’s suffered a few broken bones – including bones in his cervical vertebrae – and been knocked out, the ACL injury is the first to knock him out of the arena for a lengthy time.